The October birthstone Claddagh necklace features a lab created alexandrite along with a rhodium plated finish. The December birthstone Claddagh necklace features a lab created blue topaz along with a rhodium plated finish. This heart shape Claddagh necklace features a rhodium plated finish that is enhanced with pink enamel accenting. This silver plated Claddagh necklace features a classic design. This Claddagh necklace features a Trinity knot along with a silver plated finish. This rhodium plated Claddagh pendant features an oxidized finish along with gold plated accenting. This gold plated Claddagh pendant is enhanced with a green enamel heart. This rhodium plated Claddagh pendant features green and white glass stones. From silver to gold to rose, The Irish Gift House is bound to have a matching pair of plated Claddagh earrings that will go with the Irish necklace that you have selected. We also have additional selections of complimenting Irish jewelry on our Claddagh bracelets and our Claddagh bangles pages. 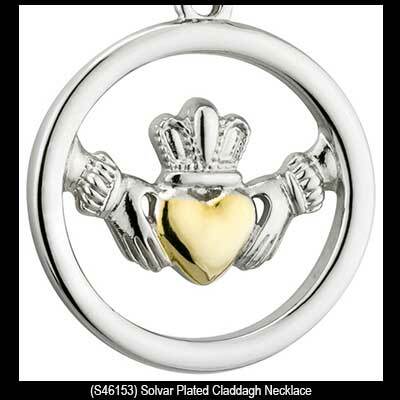 Our assortment of plated Claddagh necklaces are made in Ireland by Solvar Jewelry.